DEVENS, MA, Apr. 10th, 2017 — Comrex will be displaying at booth C1633 at NAB Show 2017 from April 24th to April 27th at the Las Vegas Convention Center in Las Vegas, Nevada. 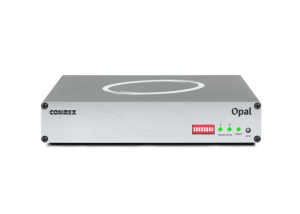 New products will include ACCESS NX, the latest audio IP codec in its ACCESS line, and Opal, a revolutionary new IP audio gateway. Other products on display will include: ACCESS 2USB and Rack, BRIC-Link II, LiveShot (Comrex’s video-over-IP acquisition and distribution tool), VH2 (a VoIP two-line hybrid), and STAC VIP. ACCESS NX features a hardware platform that is optimized for running CrossLock, Comrex’s custom reliability layer. CrossLock enables both powerful error correction and network bonding, and intelligently monitors and dynamically adjusts network connections in real-time. ACCESS NX’s updated interface improves user experience with faster processors and a five-inch capacitive touch screen that doesn’t require a stylus. Other notable new features include a new second mic input and an added second ¼” headphone jack. Opal allows remote guests to deliver “studio quality” sound, without the need for any special equipment on their end. Opal is ideal for hosts who need to coordinate call-ins with non-technical remote guests – guests can simply click a link, and connect instantly. Opal establishes the link using the Opus encoder, for excellent fidelity and low delay. Additionally, Comrex is proud to be featuring ACCESS and BRIC-Link II, its line of versatile and reliable IP audio codecs that have been adopted as an industry standard. It will also be demoing VH2, a two-line hybrid designed to provide superb audio over VoIP phone lines, and STAC VIP, a VoIP call management system for larger scale talkshows (between 6 and 12 callers). Comrex will be displaying LiveShot, live ENG technology which delivers high-quality two-way video and audio in real-time over IP networks. The National Association of Broadcasters is the voice for the nation’s radio and television broadcasters. The NAB Show attracts over 100,000 attendees, and features skill-building workshops and over 1700 exhibitors. Comrex has been attending the NAB Show for over 30 years. To learn more about Comrex or its product offerings, visit www.comrex.com, or send an email to info@comrex.com. To set up an appointment with a Comrex representative at NAB, visit http://bit.ly/2l4plXZ. Comrex develops and manufactures innovative broadcast technology to address the specific needs of broadcasters, and create products that enable broadcasters to produce live, local, imaginative remote programming. Comrex strives to provide a simple answer to a universal broadcast need ­‐ the transportation of high-­quality media to the studio from virtually anywhere, economically, at a moment’s notice. In addition to the most cutting edge technology, Comrex works to provide radically customer-oriented service to help broadcasters easily achieve creative and entertaining programming from diverse and unique locations.